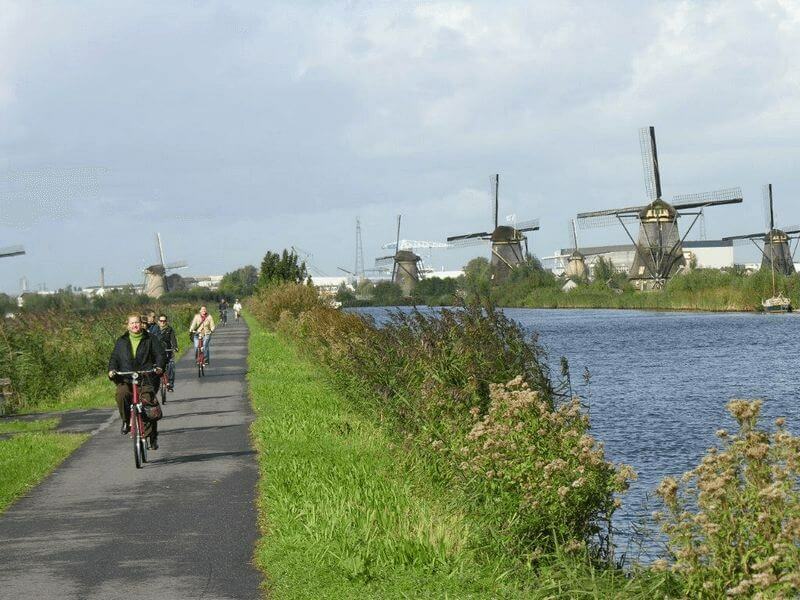 This 11-day tour through the lowlands of the Netherlands and Belgium has all the ingredients a successful bike & barge tour needs — highlights like the iconic windmills at Kinderdijk; north Belgian culture in the beautiful Flemish cities of Antwerp, Ghent, and Bruges; personal encounters with local producers as you bike through Flanders; and above all, very nice cycling off the beaten path, along quiet country roads. And because this tour per bike and ship lasts a couple of days longer than most of our tours, you will have that extra bit more time to wander around in this region’s intriguing cities, visit one or more of their world-class museums or spend an afternoon shopping. This tour’s relaxed cycling passes through the gorgeous, green – and flat – Dutch countryside in the Lower Rhine delta, the province of Zeeland, and Flanders, the western region of Belgium. 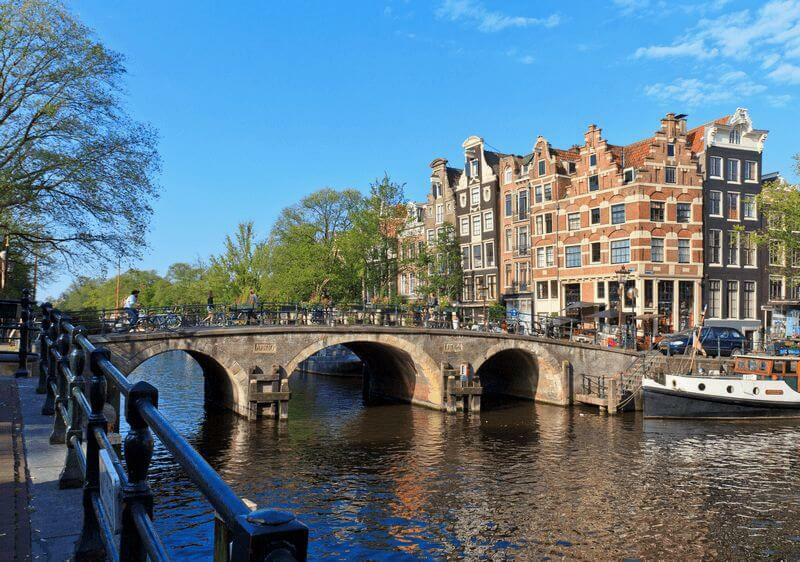 Attractions along the way include many charming villages, a visit to a real Dutch cheese farm, the 19 Dutch windmills in Kinderdijk, and the world-famous historic cities of Antwerp, Ghent, and Bruges in Belgium. You will cycle through and discover the Dutch province of Zeeland, which is essentially one big river delta where the Rhine, Meuse, and Scheldt rivers converge, and is famous for its fantastic beaches, water sport activities, and Delta works. Then, the Flanders region of Belgium awaits you, which has a reputation for its medieval towns — and superb food and drinks. Each day you will be able to discover many picturesque villages — both on your bicycle and on foot. The barge will stay for two nights in Antwerp, a cultural capital famous for its vibrant nightlife. So this means you have a whole day to discover this city, not only known as a diamond and harbor city but also as the hometown of the painter Rubens. No matter where you go, you’ll never be far from one of his masterpieces. Then there is Ghent, a lively university city, again one with a rich past. From Ghent, you bike through the pleasant countryside of Western Flanders to Bruges, widely described as the ‘Venice of the North’ and arguably the most beautiful of all the Flemish cities. 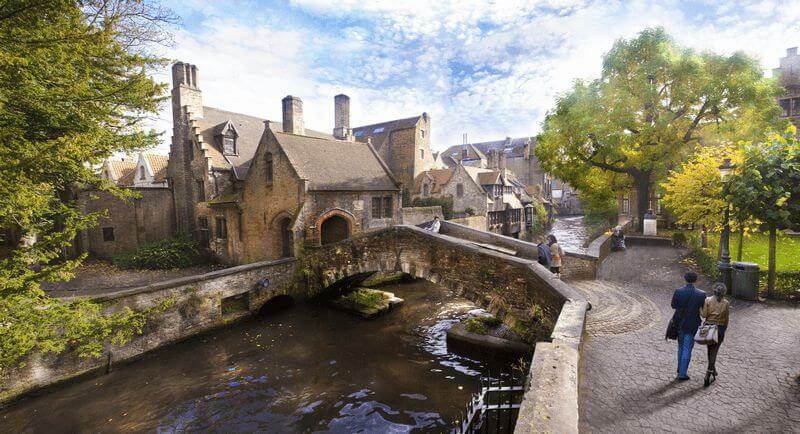 Bruges attracts more than two million visitors every year who come to see the picturesque medieval town center of the UNESCO World Heritage-listed historic city and a long list of historic attractions. Embarkation and check-in where the crew will welcome you on board are between 1 p.m. and 2 p.m. Around 2 p.m. the ship sails to Weesp. This small city on the banks of the river Vecht has a historical center with many canals and buildings dating from the seventeenth and eighteenth century. It also has a few beautiful windmills. The scenic river Vecht and the small roads along the river attract yachters and cyclists. As soon as you arrive, the tour leader will organize a test ride. After dinner, you will have time to stroll through this charming city. Your bike tour starts in Weesp, and you will cycle along the beautiful meandering river Vecht with impressive mansions on its banks. Along the way, you will visit a real Dutch cheese farm, where cheese is still produced according to traditional methods. 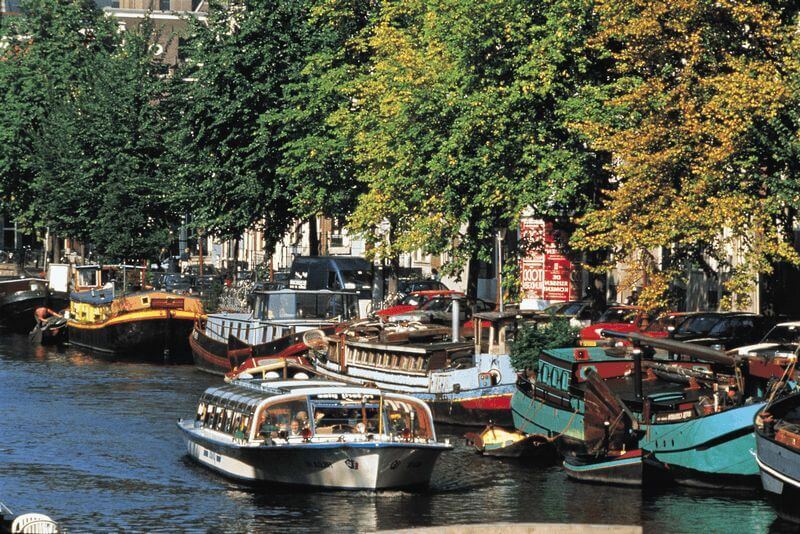 You will meet the ship in the city of Utrecht and from there, sail the Amsterdam-Rhine canal to Vianen, a small fortified town on the river Lek. Today you will cycle a beautiful route along the Lek River to Schoonhoven — a city renowned for its talented silversmiths since the 17th century, earning it the nickname Zilverstad (“Silver City”). Later in the day, as you cycle through the Alblasserwaard region, you will reach Kinderdijk, a village famous for its impressive row of 19 large windmills. 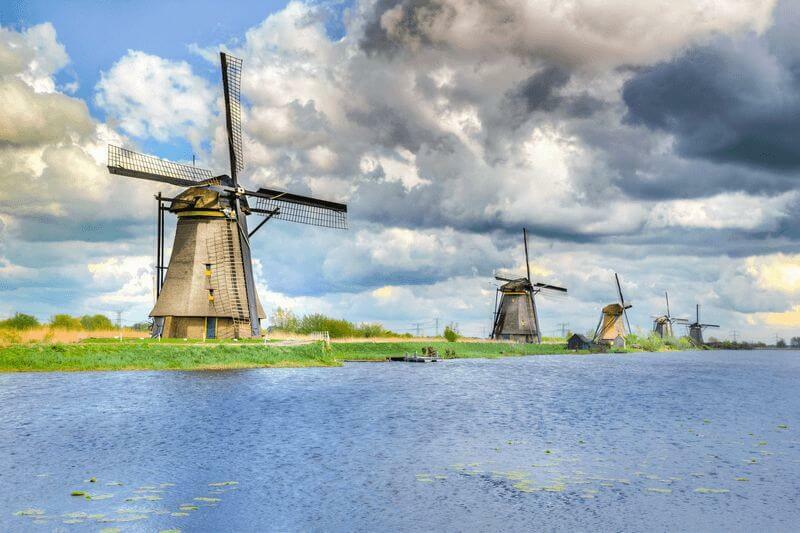 These 19 windmills are also UNESCO cultural heritage attractions and are a definite highlight of The Netherlands. You will have the opportunity to go inside one, so don’t forget to bring your camera! From nearby Alblasserdam, you will take the “Waterbus,” a fast ferry that carries you and your bicycle in approx. 10 minutes to Dordrecht. Dordrecht, or “Dordt,” as it is called by insiders, is one of the oldest Dutch cities, and sits on the confluence of three major rivers. 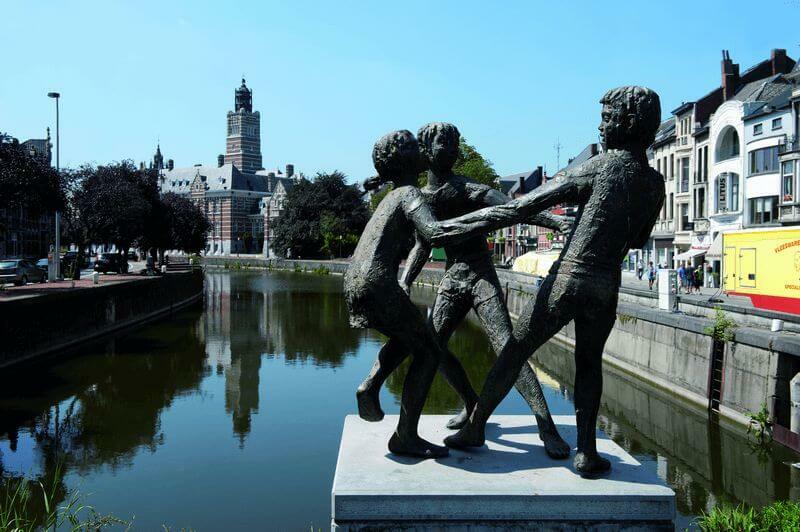 In the evening, after dinner, you can join our guide for a short city walk visiting some of Dordt’s 1600 monuments and the picturesque point where the waterways meet. As you relax with a tasty breakfast aboard your ship, the Gandalf, it will sail onwards to Willemstad where you will start your day’s cycling. Willemstad is a beautiful old fortified town on the Haringvliet waterway. From here, your bicycle tour for the day heads to Tholen, which once was an island in the middle of the large Zeeland stream system — a place where many people fished for their living. Nowadays, Tholen is connected to the mainland in various ways, but it is still a picturesque village with many relics from an eventful past. After coffee and breakfast, you will leave the barge for a bicycle tour through the “Wouwse Plantage” forest, heading south to the impressive Kreekraksluis, or Kreekrak lock. In the afternoon, you will once again board the ship to cruise to the port city of Antwerp, which is situated on the river Schelde. 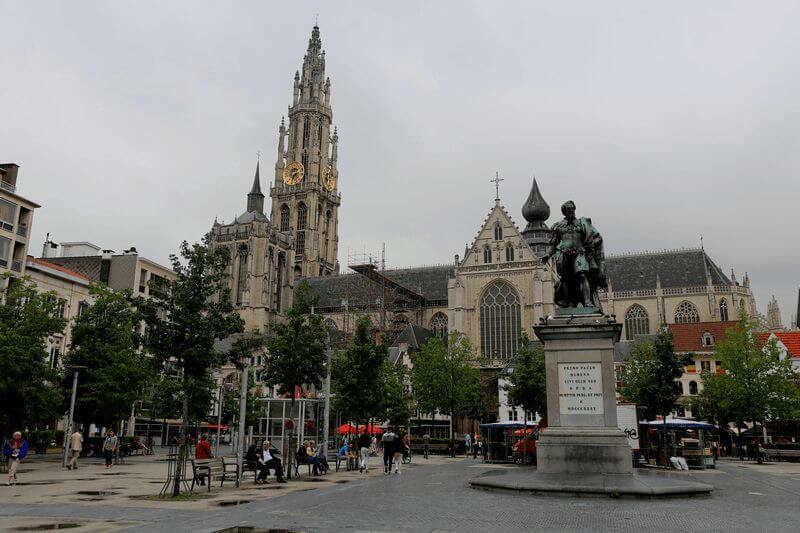 Antwerp is famous for handling up to 80% of the world’s rough diamonds and is a city with a long list of delightful attractions in store for you. 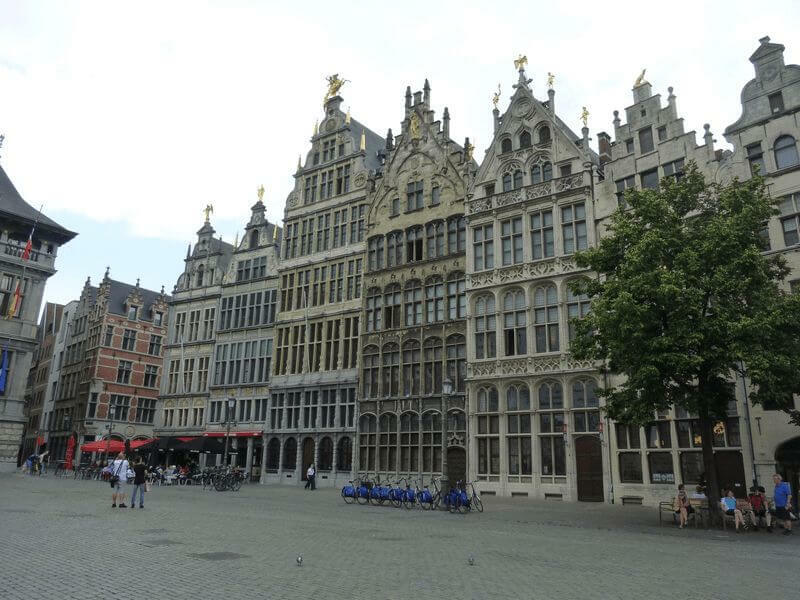 These include the City Hall — one of several majestic buildings constructed during the Renaissance period — the Grote Markt historical city square, the Onze-Lieve-Vrouwe Cathedral, and the medieval Steen Castle. 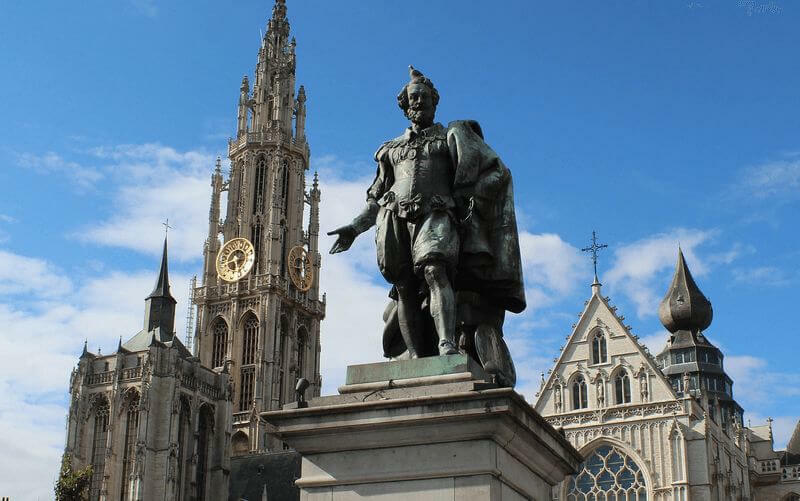 Other ideas for spending a pleasant afternoon here are to visit the famous beer brewery of ‘de Koninck’ for a tour and tasting, explore the fascinating Museum on the Scheldt River (MAS — Museum aan de Stroom) or go shopping in Antwerp’s welcoming shopping area. Dinner tonight is not included as you have the chance to dine at a restaurant of your choosing. If needed, your crew can provide restaurant recommendations. This morning, you will cycle out of Antwerp along a striking section of the Schelde River to St. Amands, where your home away from home will dock for the night. There is only one way to describe the scenery along the Schelde, and that is “magnificent.” Its natural splendor is, without doubt, one of the highlights of the tour. In the evening, if you haven’t already taken the chance to taste one of Belgium’s incomparable “biers,” then make sure you give them a try — the famous Duvel brew is a specialty of the region. During breakfast, the ship will bring you to the city of Dendermonde. Here you’ll disembark and continue to bike along the Schelde River to Ghent, where the ship will moor for the night at a lock in a suburb of the city. 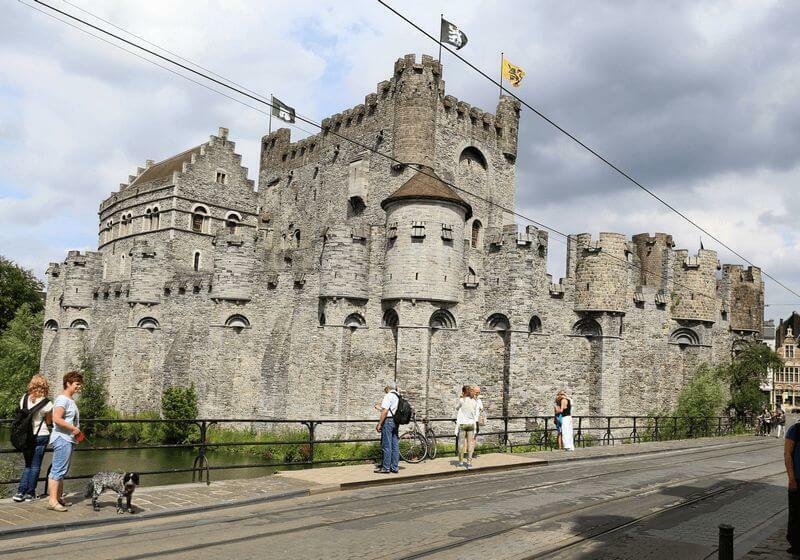 Ghent is a lively university city that boasts a rich history: Since Roman times, Ghent’s position at the confluence of the Leie and Schelde rivers has ensured its success as a trading port, at one point making it the second biggest city in Europe. The old city features an Opera House, a total of 18 museums, more than 100 churches and over 400 historical buildings. Two of the major attractions are St. Bavo Cathedral — where a number of medieval art masterpieces are kept, including the world-famous ‘Adoration of the Mystic Lamb’ by Jan van Eyck — and the 91-meter-tall belfry of Ghent, which is one of three medieval towers that overlook the old city center. Tonight, your floating hotel will be docked close to the city center of Ghent, giving you the chance to explore at your leisure. After a fortifying breakfast, you will cycle onwards from Ghent through the beautiful Flemish countryside of Western Flanders to Bruges, which is widely described as the ‘Venice of the North’ and arguably the most beautiful of all the Flemish cities. 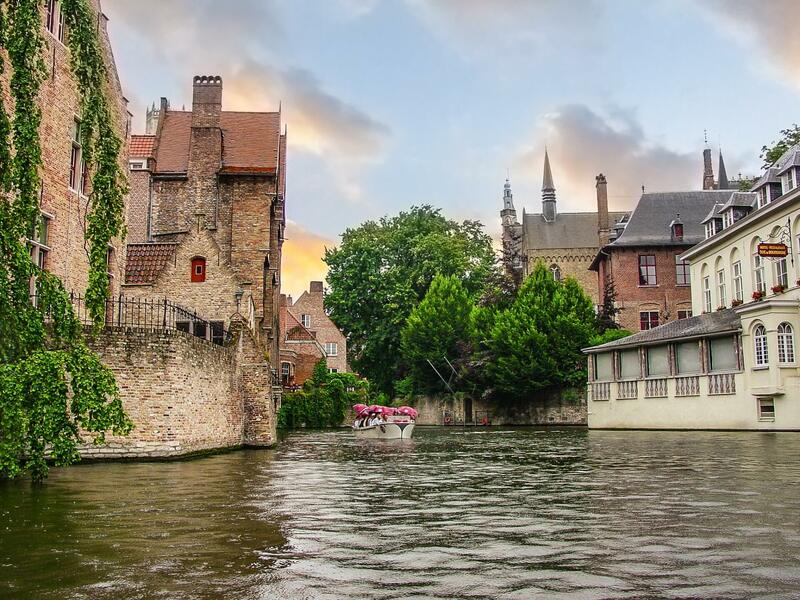 Bruges attracts a great many European and foreign holidaymakers thanks to its picturesque, UNESCO-listed medieval city center and a wealth of attractions for history lovers. 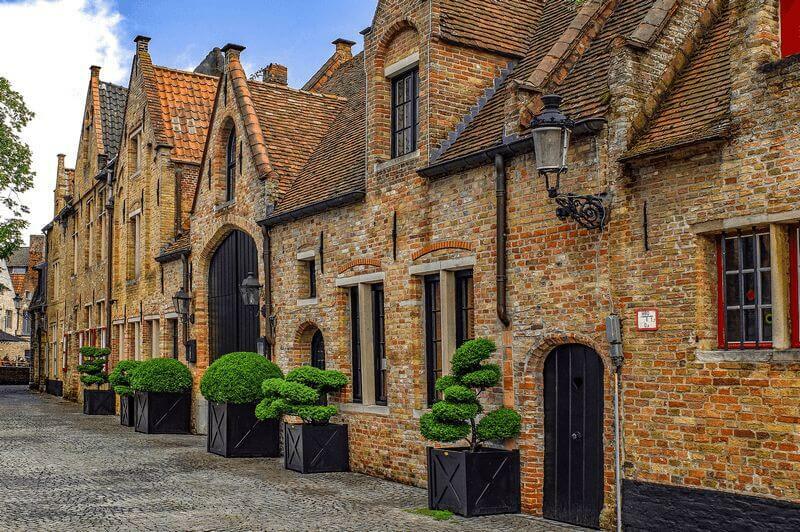 An outstandingly-preserved example of a medieval settlement, Bruges has managed to maintain its historic fabric as it has evolved over the centuries, with the result that today the city’s original Gothic buildings form an integral part of its identity. 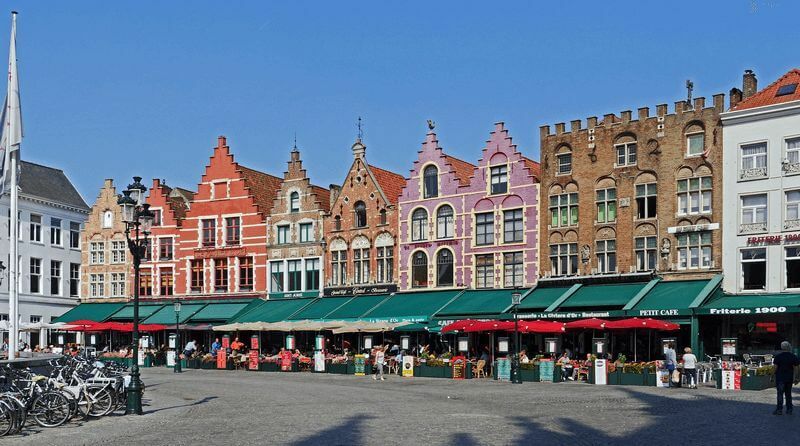 While you are here, you can visit one of Bruges’ many museums or simply take in the stunning beauty and culture of this unforgettable city from the comfort of a sidewalk café. In the evening, your guide will take you for a walk to show you some beautiful parts of the city center — and maybe you can even taste a ‘Brugse Zot,’ a famous local beer. Today your barge will stay in Bruges, giving you the choice of how you would like to spend the day. The tour leader will offer a morning bike tour of about 37 km. 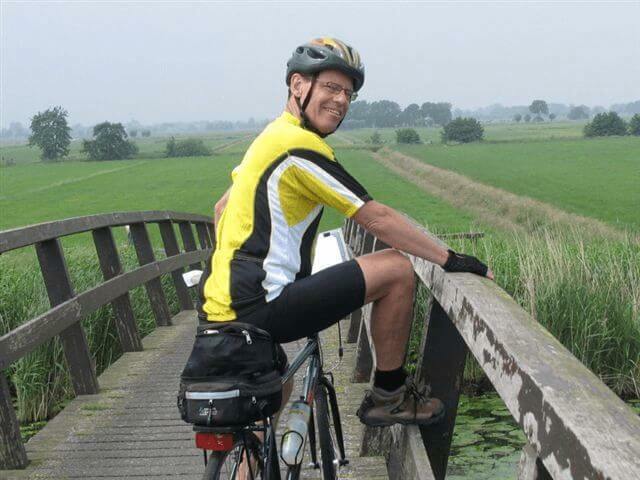 Your final cycle will set out along a quiet canal, past beautiful poplar trees, and through attractive landscapes of flat green polder fields dotted with small farmhouses (a polder is a low-lying tract of land enclosed by embankments). On the return ride to Bruges, you will cycle along a charming little canal. 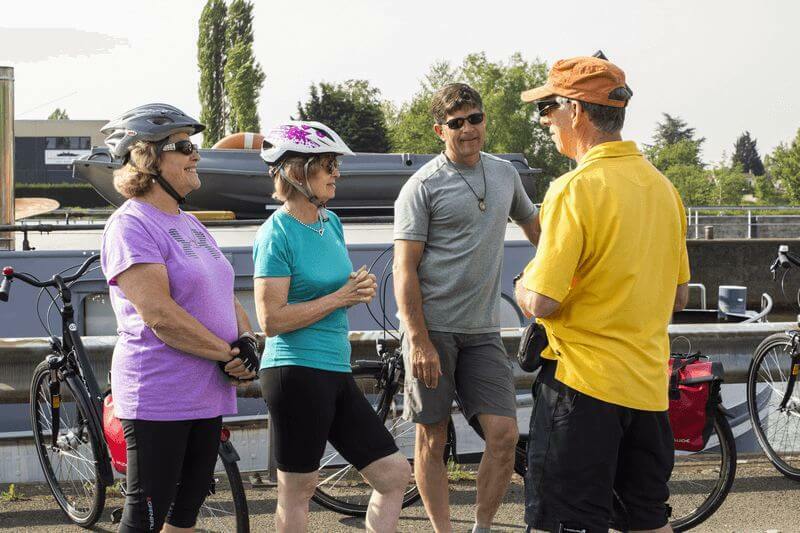 The end of your tour: Enjoy one final breakfast and disembark by 9.30 a.m.
On this Tour with more than 22 guests, the daily cycling tours will be accompanied by 1 knowledgeable and multi-lingual tour leader. On most days the tour leader will offer a long and a short (or a quicker and a more relaxed) bicycle option. On the arrival day is it possible to bring your luggage on board from 11 p.m.
Embarkation time is between 1 p.m. and 2 p.m. in Bruges, where your lovely ship awaits you in the Bruges Harbor. After a welcome and briefing from your friendly and experienced crew at 2 p.m., there is time for bicycle allocation and a short but sweet test-ride through the countryside around Bruges. After dinner, our guide will introduce you to the city with a short walk through its gorgeous medieval center. 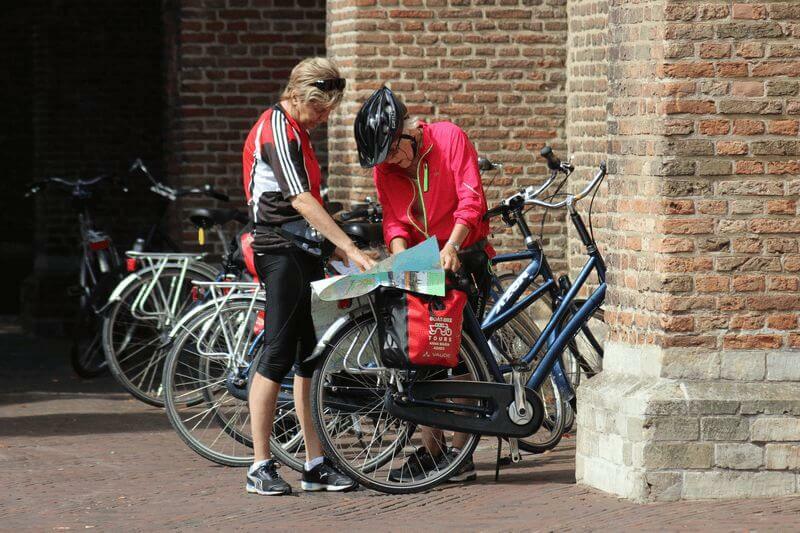 After a sound night’s rest, your tour leader will guide you on a morning bike tour of about 37 km. 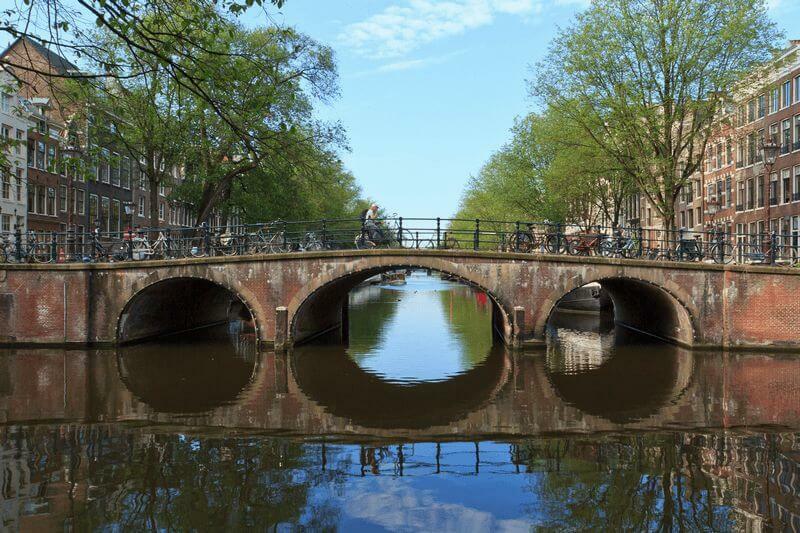 Your first tour will set out along a quiet canal, past beautiful poplar trees and through attractive landscapes of flat green polder fields dotted with small farmhouses (a polder is a low-lying tract of land enclosed by embankments). On the return ride to Bruges, you will cycle along a charming little canal. In the afternoon, you will have time to discover this marvelous UNESCO World Heritage-listed historical city, which is aptly nicknamed “the Pearl of Flanders.” While you are there, make sure you visit one of Bruges’ many museums or simply take in the stunning beauty and culture of this unforgettable city from the comfort of a sidewalk café. After enjoying breakfast on board, you’ll start cycling out of Bruges, zigzagging through charming woodland and pastures. Your barge will be patiently waiting for you halfway along the canal between Bruges and Ghent. Once everyone is back on board, the anchor will be lifted, and you can enjoy the scenery as you cruise onwards to Ghent. In the evening, you can take a nice guided tour through the historical center of Ghent, seeing it from one of the best perspectives possible — from a small canal boat that passes delightful areas like the Graslei and Korenlei. 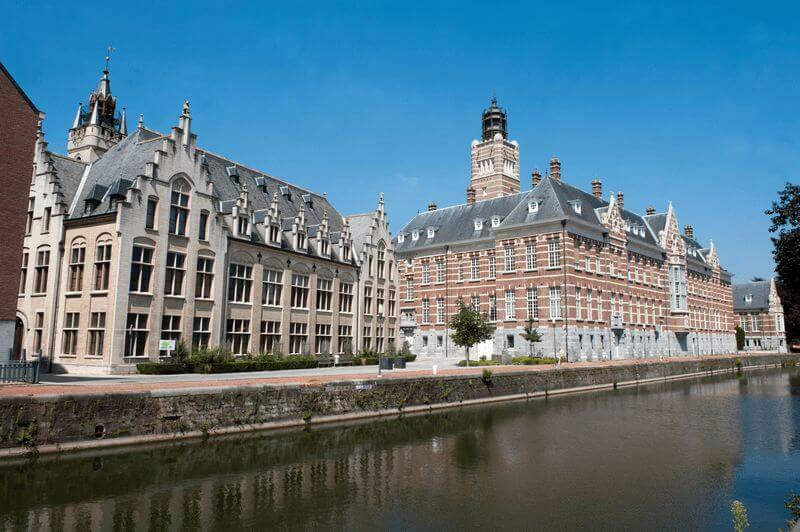 Ghent is a lively university city, also with a rich past. 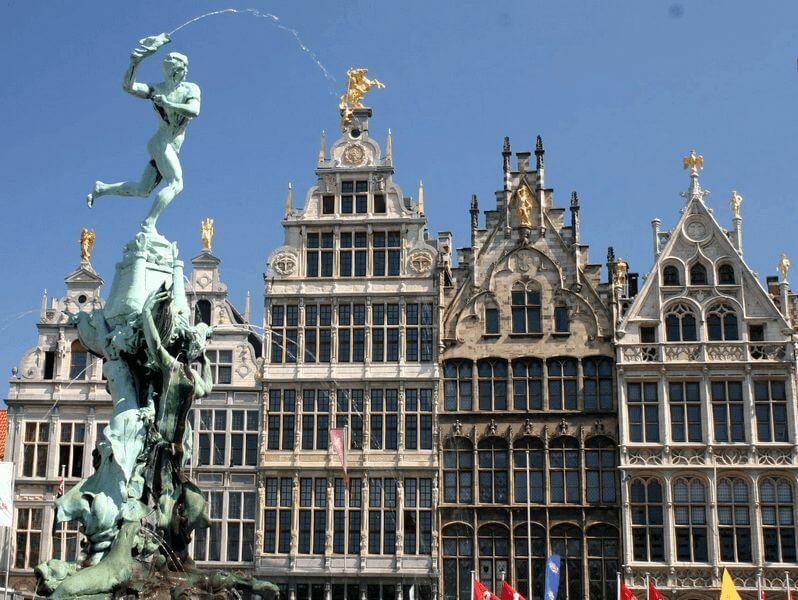 The city has its origins in Roman times, where it arose at the confluence of the rivers Leie and Scheldt. 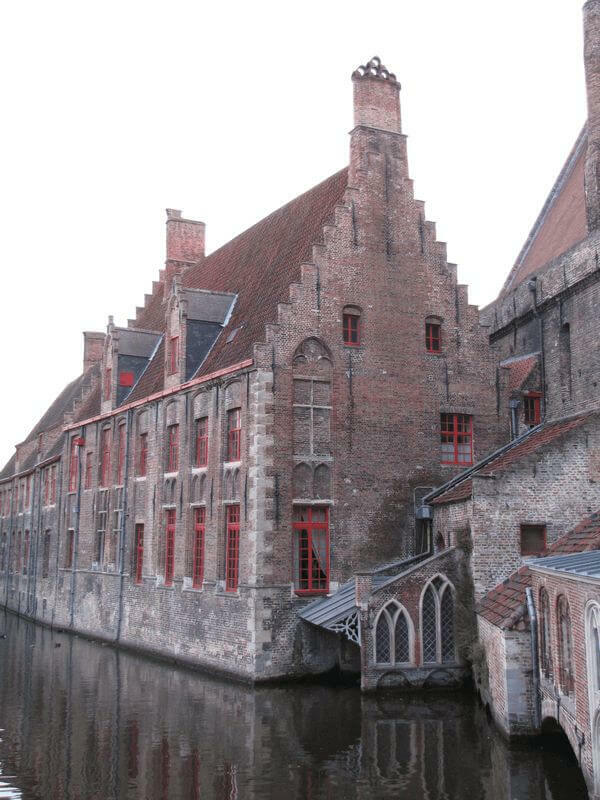 This favorable site resulted in great prosperity over the years, which peaked in the late 13th, and early 14th centuries when textile manufacturing brought great wealth to Ghent. In the city center, many old patrician houses have been skillfully preserved in all their glory. The impressive Clothmakers’ Hall (1425) is where textile merchants used to meet, and Ghent’s major church is St. Baafs’ Cathedral, which was built across various ages and in various styles. In the cathedral, you can admire a number of masterpieces of medieval painting, of which the “Adoration of the Lamb” by Jan van Eyck is the most famous. After a delicious breakfast in Ghent, you will cycle downstream through diverse landscapes, along the tidal Schelde River to Dendermonde, located at the confluence of the Dender and Schelde rivers. There is only one way to describe the scenery along the Schelde and that is: “magnificent”. Its natural splendor is, without doubt, one of the highlights of the tour. During this section of the Schelde, the speed of your ship will be determined by the height of the tide. You will travel from Dendermonde to St. Amands by either bicycle or barge, depending on the tides. You and your ship will spend a relaxing night docked in St. Amands. Today, we will follow the Schelde River further downstream through the Temse region to Antwerp. Over the centuries the Schelde River held strategic importance for the Romans, Vikings, Spanish, and Napoleon… Today it is a stunning waterway just perfect for bike and barge holidays! 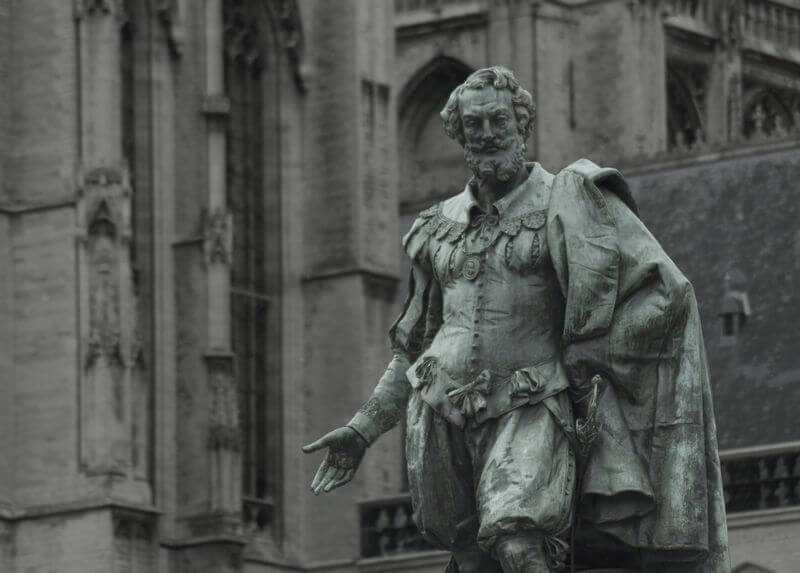 Antwerp, your shining destination for the day, is a harbor city famous for handling up to 80% of the world’s rough diamonds — and as the birthplace of the famous painter Sir Peter Paul Rubens. This city has many delights in store for you, including the City Hall — one of several majestic buildings constructed during the Renaissance period — the Grote Markt historical city square, the Onze-Lieve-Vrouwe Cathedral, and the medieval Steen Castle. This morning, your ship will sail along the Schelde-Rhine Canal and through the huge Kreekrak lock system. 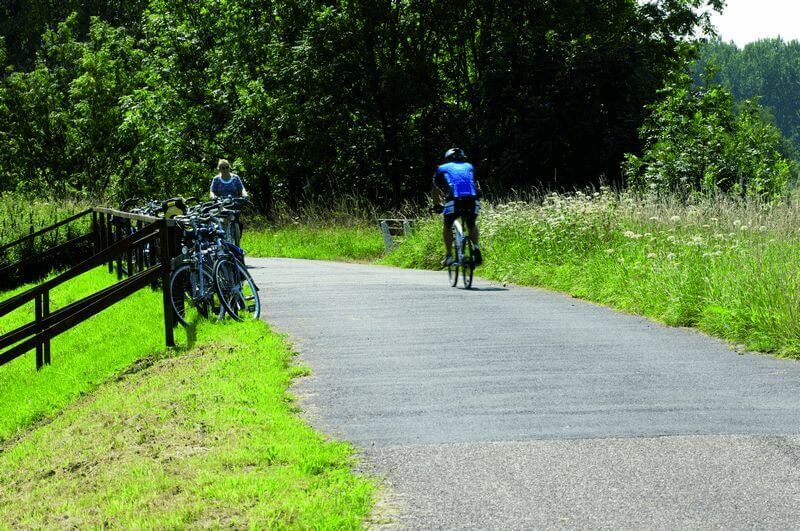 Here, your bicycle tour starts through the beautiful “Wouwse Plantage” forest to Tholen. Tholen once was an island in the middle of the large Zeeland waterways, where many people fished for their living. Nowadays Tholen is connected to the mainland in various ways but it is still a picturesque village with many relics from an eventful past. Your bike tour today passes through the pleasant Tholen village of Oud-Vossemeer to Willemstad, an old fortified town on the Haringvliet inlet of the North Sea. From here you will board the ship again for a pleasant afternoon sail to the city of Dordrecht, one of the oldest cities in the Netherlands. 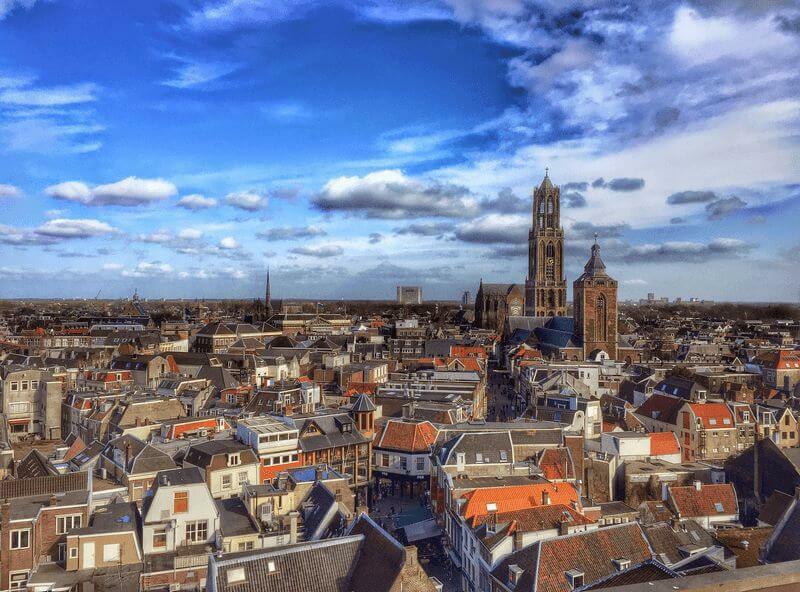 In the evening, your guide will lead you through the city as they bring the history of the Netherlands to life. We spend the night in the port of Wolwevershaven, which has a rich history dating back to 1609 when it emerged as a trading center for wool weavers. Today you will start your tour with the “Waterbus”, a fast ferry that will take you and your bicycles to Alblasserdam in just 10 minutes. After a few minutes of cycling, you will reach Kinderdijk, a village famous for its impressive row of 19 UNESCO cultural heritage-listed windmills – one of which you can visit (don’t forget your camera!). The windmills were constructed in the 18th century to pump water out of the low Alblasserwaard polder. 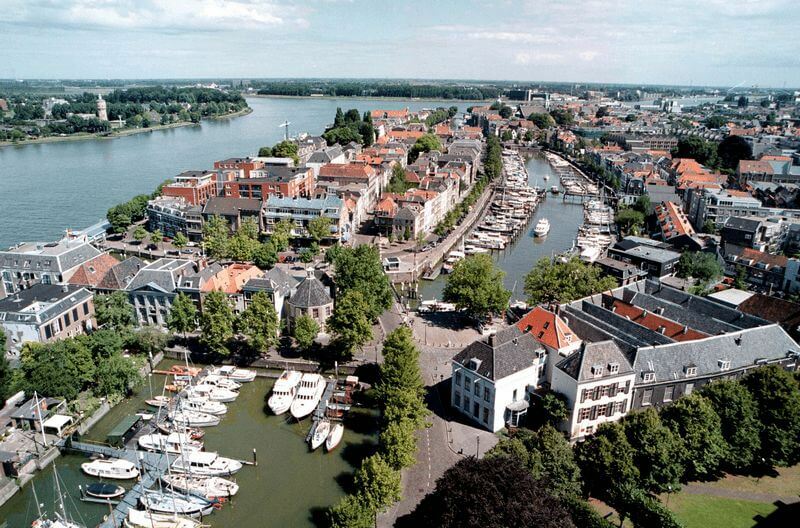 You will then continue to cycle to Vianen via Schoonhoven, a small fortified town on the river Lek (Lower Rhine), where you will stay for the night and where you can explore at your leisure after a scrumptious dinner. As you enjoy breakfast, the ship will cruise to Breukelen where you’ll disembark to begin your final day of cycling. Ride along the Vecht River in an area famous for its beautiful mansions, small castles, and impressive houses with expansive gardens. After cycling through the villages of Nieuwersluis, Loenen, and Vreeland, you will arrive at Nigtevecht where you can treat your tastebuds by visiting a traditional cheese farm. 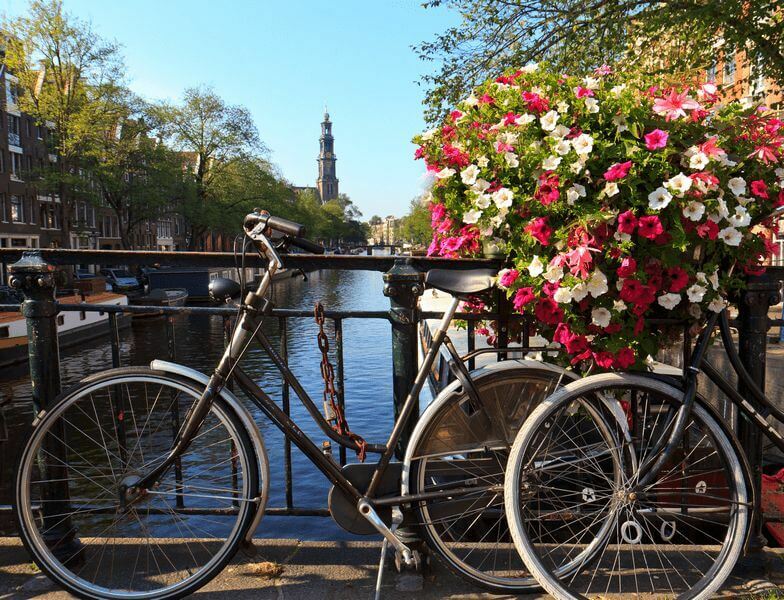 Continue cycling through the historical town of Muiden and on to Amsterdam, where you will meet your lovely barge for the final time in the Amsterdam harbor. The end of your tour: enjoy your last breakfast on board and disembark before 9.30 a.m.
Coffee and tea on board during breakfast and after the cycling tours, till 4 p.m.
Helmets: A helmet can be rented for € 10 per tour, only on prior reservation and payment.